Bruschetta is an Italian dish, whose origin dates to as early as the 15th century. In its simplest form it consists of grilled bread rubbed with garlic and topped with extra-virgin olive oil, salt and pepper. There are innumerable variations, although tomato, basil and mozzarella is a favourite and probably the best known topping. 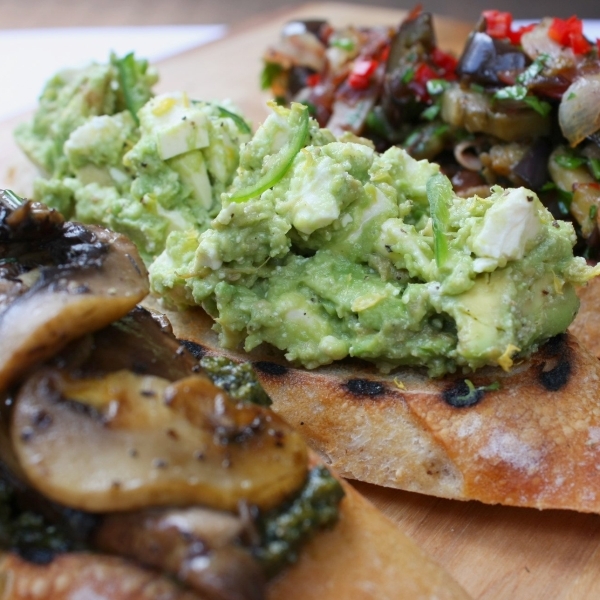 I wanted to celebrate wonderful flavours in these three bruschetta toppings. They feature mushrooms, avocado and eggplant, with other bold flavours like basil, lemon, fresh red chilli and cumin seeds. Each recipe will make 4 – 6 bruschetta generously topped, depending on the size of your bread. I’d suggest a chewy sourdough or ciabatta. For a party, or for lunch; mixed and matched or just one type; they are a simple, healthy and very delicious way to eat the best of summer. It is a wonderful thing to harvest vegetables and herbs from your own garden, come inside, cook them, and then share with those you love. Even on a scorching summer’s day it was a joyful experience to prepare them. At our place the bruschetta were a hit with all, and even a former mushroom avoider gave me a thumbs up. To cook the bread, heat a griddle pan until it is quite hot and then grill the bread on both sides until it is nicely charred, crispy on the outside, but still chewy inside. Slice a garlic clove in half and rub the toasted bread gently with the garlic. Then, choose your topping(s) and create something beautiful. Heat a large frying pan over a high heat. Slice the mushrooms and then cook quickly in the pan with the garlic and 1 tablespoon of olive oil. Stir frequently, until the mushrooms are golden brown and any juices evaporated. This should only take about 5 minutes. Add the verjuice or lemon juice to the pan and then the butter, and toss until all the mushrooms have their just coating. Finally, season with sea salt and black pepper and sprinkle over the chives. 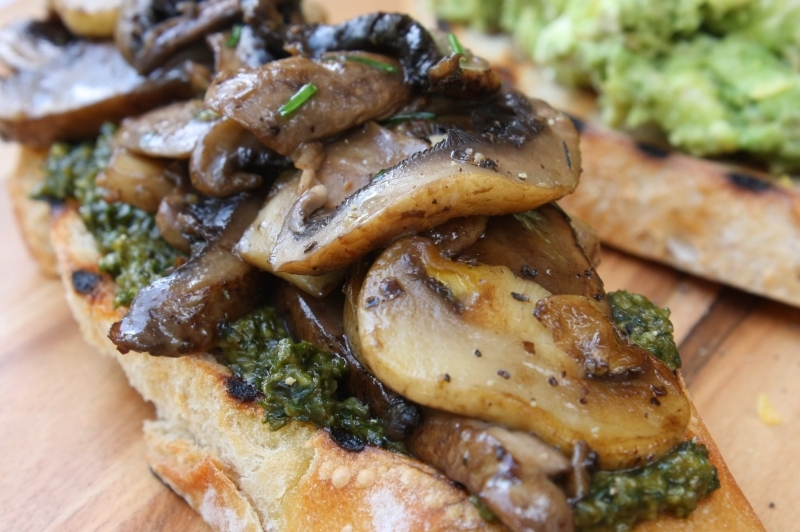 Spread the pesto on the toasted bread and then pile the mushrooms on top. Scoop the flesh out of the avocados and place in a small bowl. 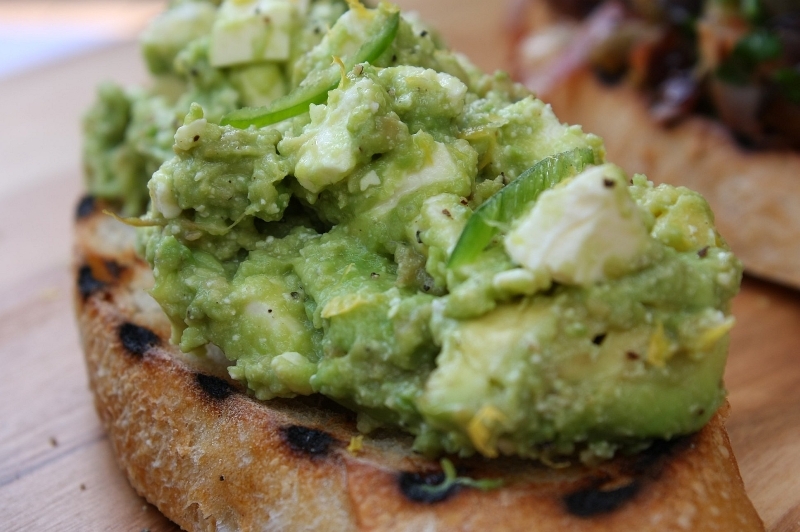 Add the cheese, lemon zest and juice and mash together with a fork until combined, but not smooth, Season well with sea salt and black pepper and then top the toasted bread with the silky avocado and feta mixture. Scatter over the sliced green chilli and serve. 300g eggplant, chopped – I grow my own and they do not require slicing and sprinkling with salt before use to extract any bitter juices. If the eggplants you use are smallish, it is likely you won’t need to either. If you are using a large eggplant, I would err on the side of caution and salt it, drain and rinse before cooking. Heat 2 tablesoons of olive oil in a medium sized pan until quite hot and add the eggplant, garlic, cummin seeds and onion. 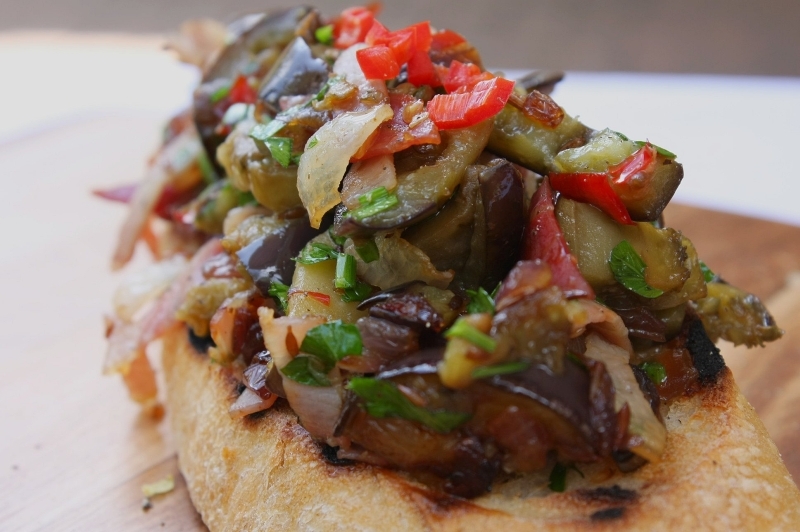 Cook until the eggplant and onion are soft and golden brown, about 5 minutes. Add the proscuitto and cook for a further 2 minutes. Season with a small amount of salt and lots of pepper. Stir through the parsley and red chilli, pile onto the bruschetta and serve.